Statue Of Benvenuto Cellini, A Famous 16th Century Italian Goldsmith, Sculptor, Draftsman, Soldier, Musician, And Artist In The Uffizi Colonnade In Florence, Italy. Lizenzfreie Fotos, Bilder Und Stock Fotografie. Image 111725944. Standard-Bild - Statue of Benvenuto Cellini, a famous 16th Century Italian goldsmith, sculptor, draftsman, soldier, musician, and artist in the Uffizi Colonnade in Florence, Italy. 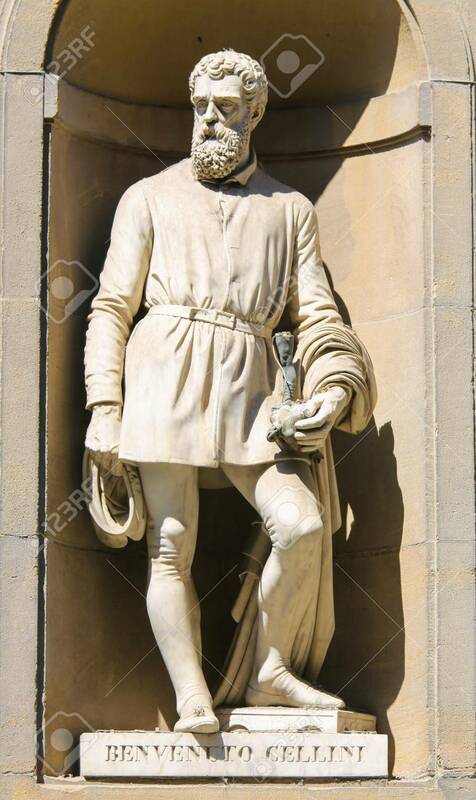 Statue of Benvenuto Cellini, a famous 16th Century Italian goldsmith, sculptor, draftsman, soldier, musician, and artist in the Uffizi Colonnade in Florence, Italy.